This photo was pasted to the back side of the manual training class picture. left to right: Fred (top), Bill and Joe Wenzel on Cooper Mountain. 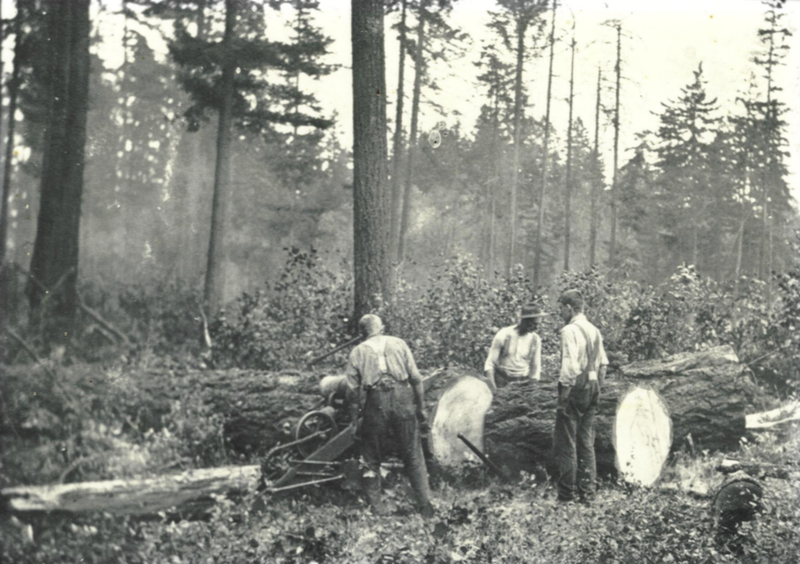 Cutting wood with a dragsaw on Wenzel farm on Cooper Mountain 1916. 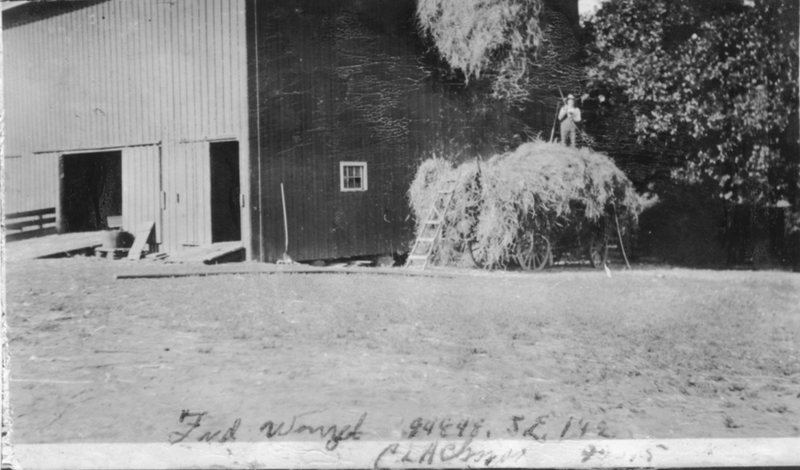 Fred Wenzel on top of log, a Mr. Neilson owned a lumber mill and is in this photo. 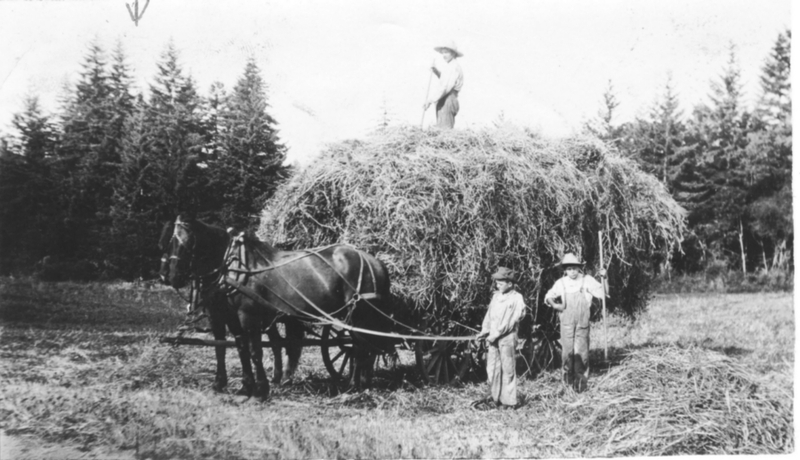 His mill cut RR ties and lumber which they transported by wagon to Progress where they were loaded onto Gondola RR cars. 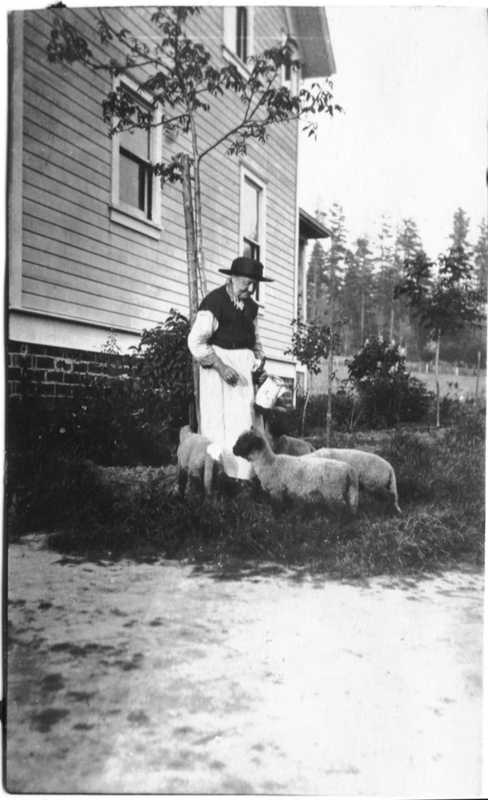 Philomena Kuschel Kahler with lambs. 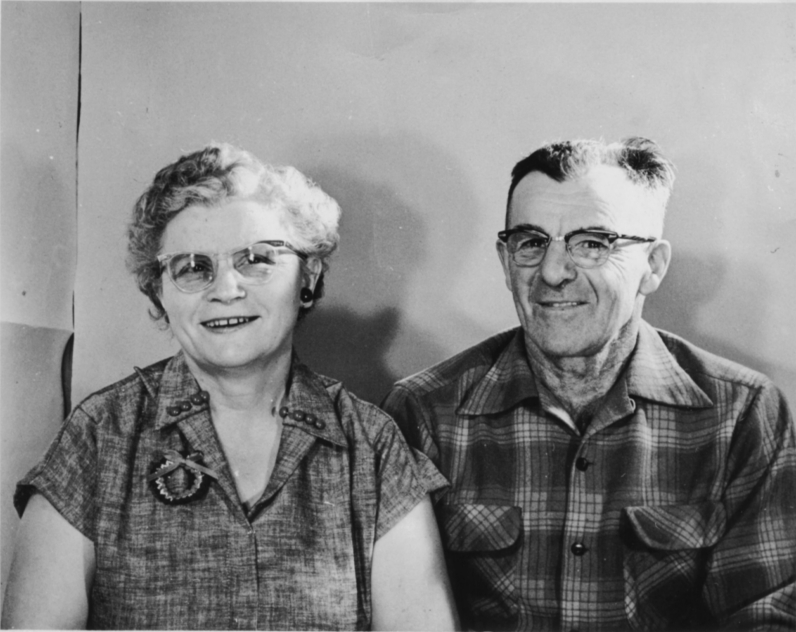 Margaret and Fred Wenzel, taken in the 1950's. 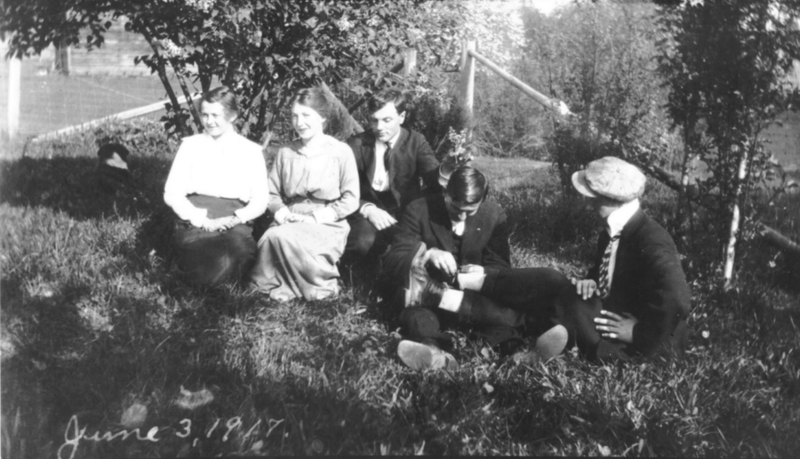 Five people and a horse, all unidentified. 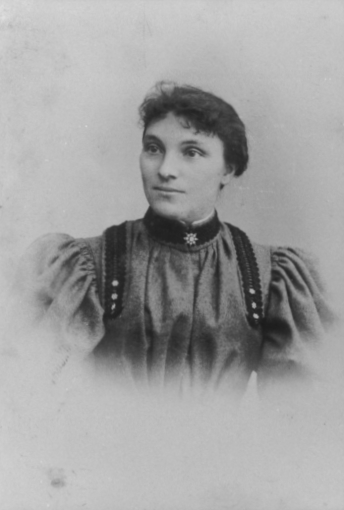 Philomena Kuschel Kahler. Not sure the date of picture. 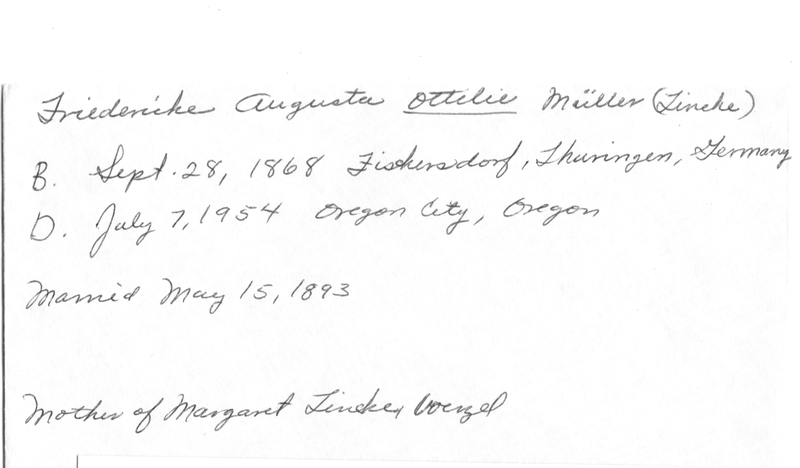 Envelope with notes to indicate that this photo is of a woman who is the mother of Margaret. 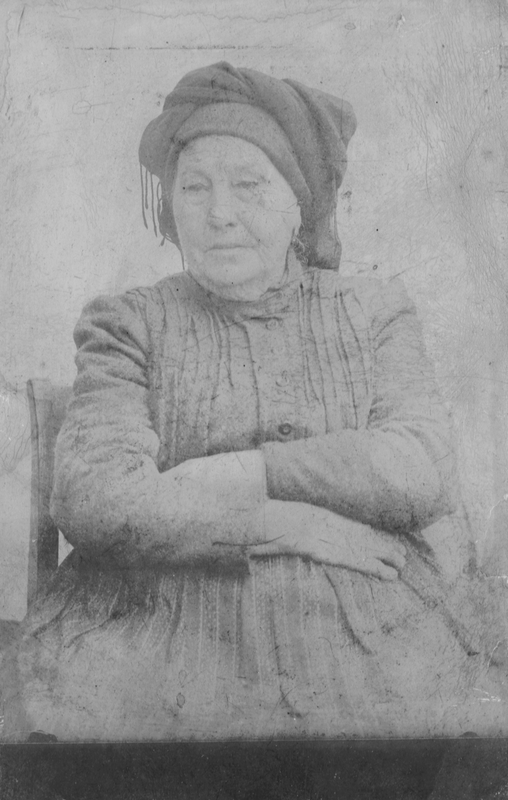 This was her "passport-quivalent" photo; passports as such weren't actually required yet. 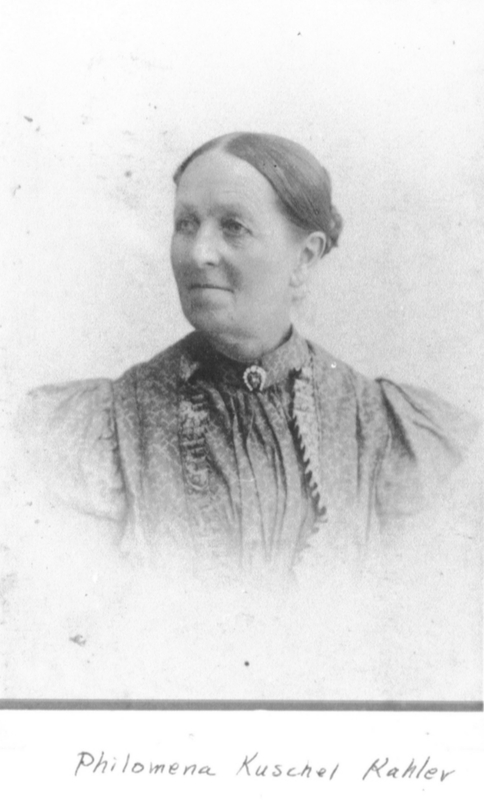 Robert's grandmother - Margaret Lincke Wenzel. Notes written in a fine German hand and language. 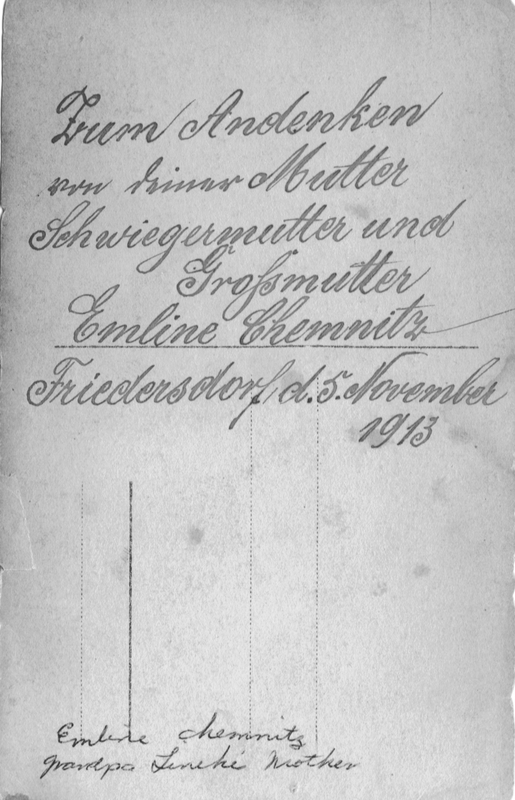 "Mutter" is used 3 times; mutter, Schwiegermutter, and Grofsmutter Emline Chemnitz. November 5, 1913. 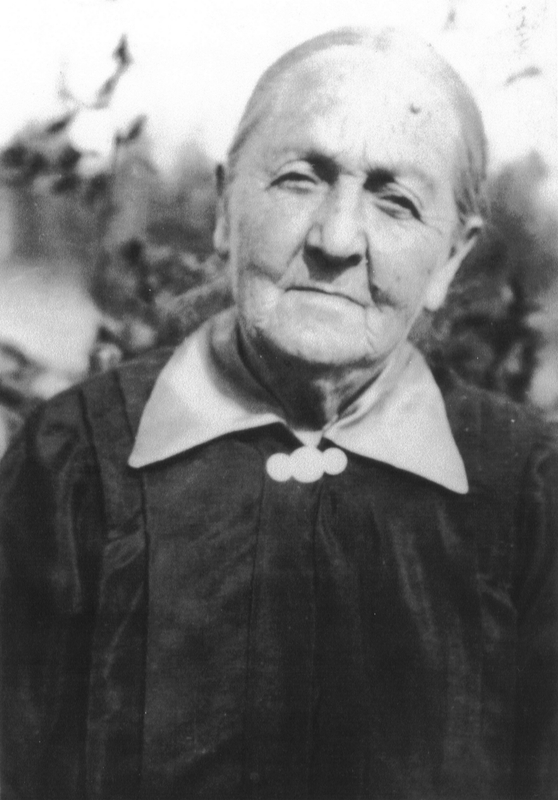 Grandmother - Grandpa Lincke's mother, Emline Chemnitz. Photo apparently taken in Friedersdorf, Germany. June 3, 1917. Augusta Wenzel, Lena Grabhorn, Roy Bierly, unidentified man, Fred Grabhorn. Wedding 1920 Augusta and Kurt Braune. 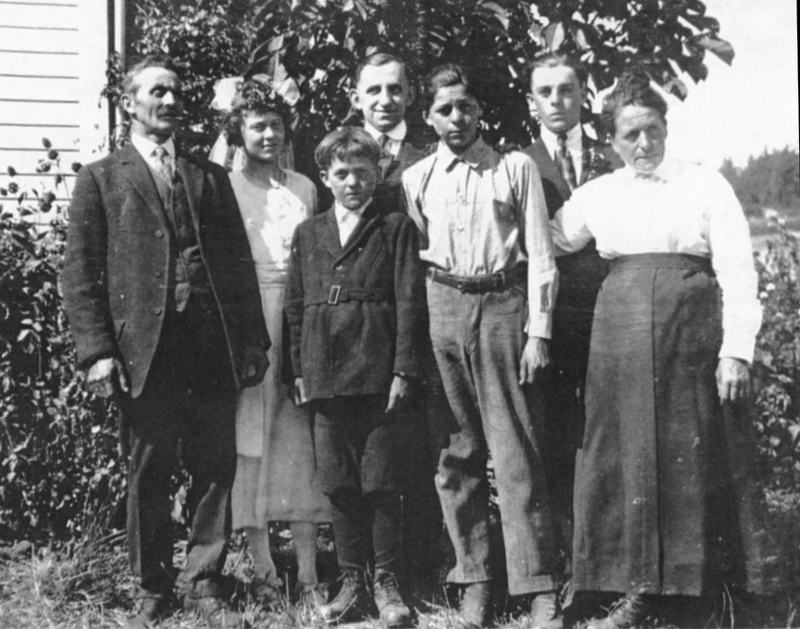 Left to right: August Wenzel (father), Augusta Wenzel, Kurt Braune, Bill Wenzel, Fred Wenzel, Martha Wenzel (mother). Joe Wenzel in front. 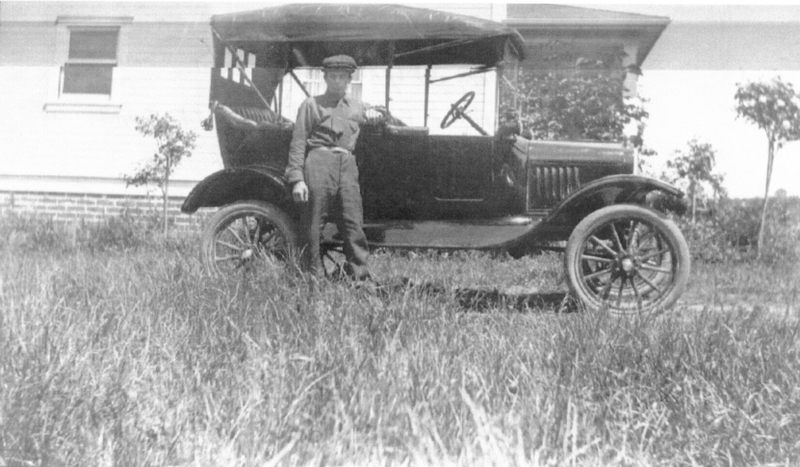 Alfred (Fred) Wenzel and the 1918 Model T Ford when it was virtually new. View looking north to front porch at Wenzel farmhouse, Cooper Mountain, Beaverton. This photo is from a badly copies original. No original was found. 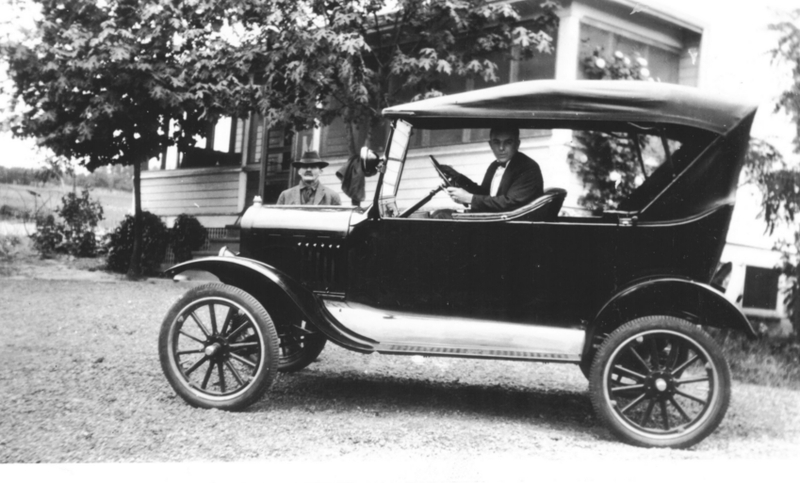 The Model T with Grandpa August Wenzel behind the car and Alfred Wenzel driving. 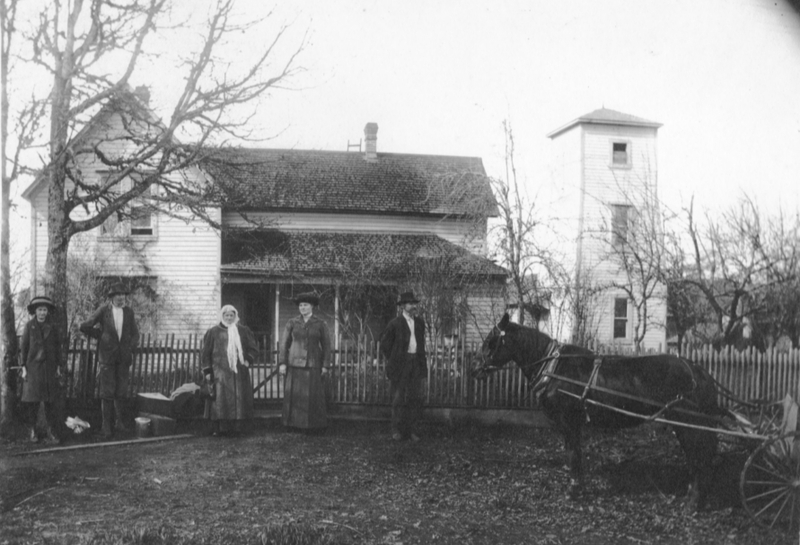 Front of Wenzel farmhouse, notice the maple trees are far older in this photo. 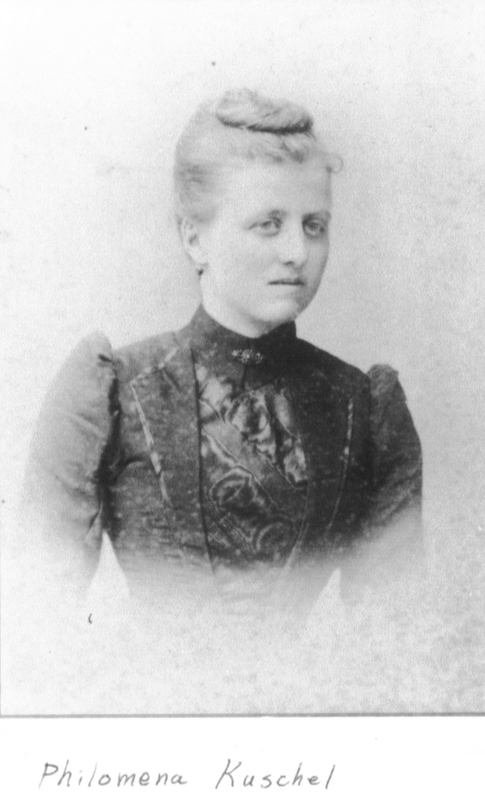 August and Martha Wenzel. Building what looks like Grabhorn road about 1910. 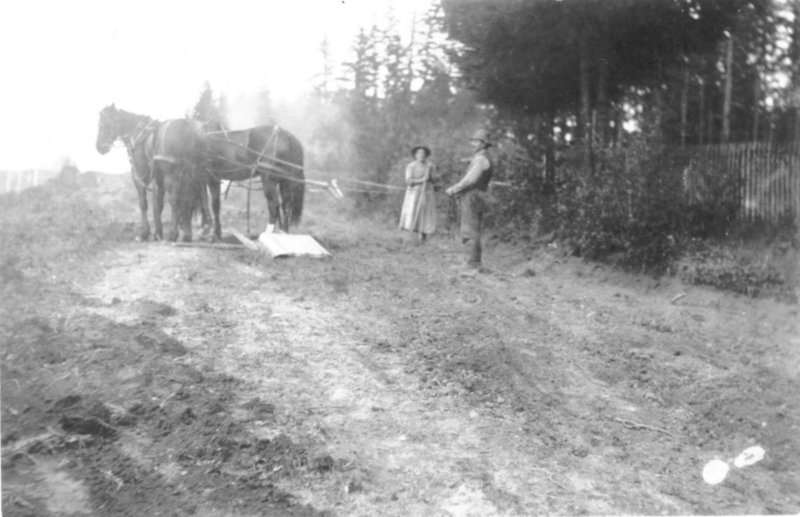 Back when building the road was part of the farm chorse! Judging from the shadows and light, photo is looking north. 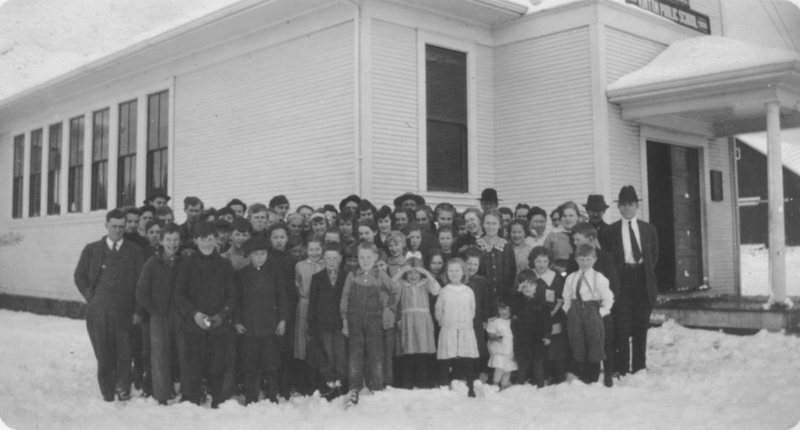 1908 Kinton School Picture. Kids in snow, building looks freshly painted and newly built. Note school sign on front of building. 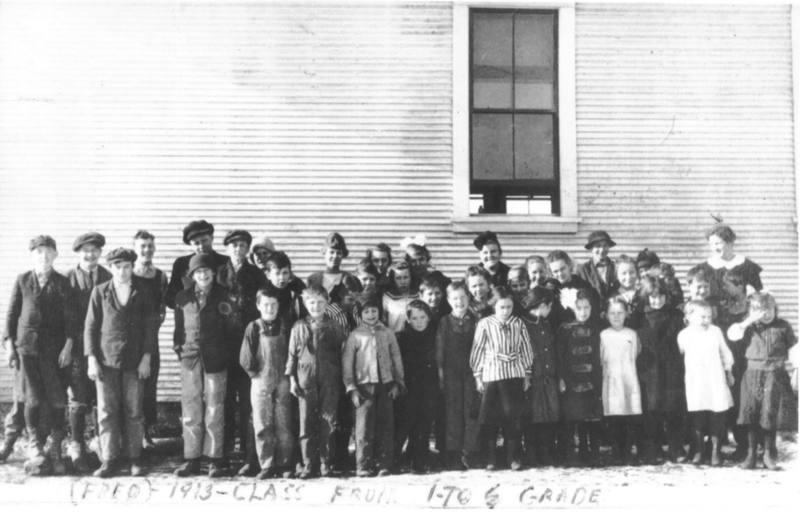 School group 1913. Fred Wenzel 3rd from left.